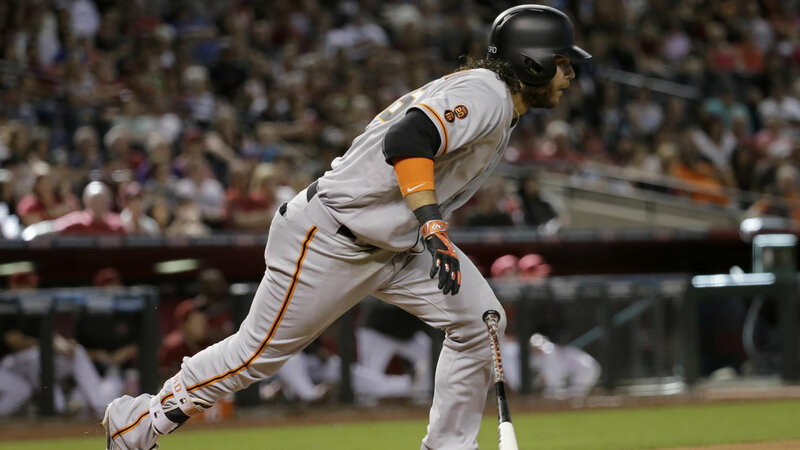 SAN FRANCISCO -- Manager Bruce Bochy successfully challenged to get a game-ending double play after Brandon Crawford singled in a run in the ninth inning and the San Francisco Giants beat the Arizona Diamondbacks 2-1 on Sunday to complete a four-game sweep. Bochy challenged that Rickie Weeks was safe at first base on what turned out to be a 4-6-3 double play. If the call had stood, the tying run would have scored from third. It was San Francisco's fourth double play of the game. Arizona manager Chip Hale also challenged the final play, unsuccessfully contending that shortstop Crawford was off the bag. The Giants had just one hit - Trevor Brown's home run - through eight innings. But they opened the ninth with three singles off Brad Ziegler (1-2). A walk and Brandon Drury's fourth single of the game put runners at first and third with one out in the ninth but pinch-hitter Weeks grounded to second on the play that ended the game. The Diamondbacks fell to 5-16 at home. The loss spoiled a big day for Rubby De La Rosa. The Arizona starter allowed one hit in 6 2/3 innings but got no help from the sputtering Arizona offense, which scored six runs in the four games against the Giants. De La Rosa struck out seven and walked four. Matt Cain scattered seven hits but shut the Diamondbacks down on one run through seven innings. He struck out five and walked two in his second straight strong start but he remained winless (0-5) for the season. The Diamondbacks lost in the ninth for the second game in a row. Buster Posey's two-run double in the ninth gave San Francisco a 5-3 win Saturday night. The Diamondbacks' lone run came on Paul Goldschmidt's sacrifice fly. They had runners at third four other times, twice with one out.